Sometimes we’re working on projects and forget to update our reels with newer or different TV spots. Every year we produce major healthcare ad campaigns. We work with agencies across the country as well as clients who internally handle their own creative marketing. Przyborski Productions is one of the few commercial production companies that realizes production inside a busy hospital is not the same as filming in a studio. We know how to work with doctors and medical teams to get great footage with minimal disruption. We’re very aware that real patients take precedence over the filming process. The commercials featured on this reel demonstrate some of Glenn Przyborski’s directorial styles and techniques that enhance a project’s concept. All doctors and hospital staff are real. Testimonials feature real patients. All operating room scenes were photographed during actual procedures. This Friday, April 7th, the Rock and Roll Hall of Fame will induct England’s popular 70’s & 80’s rock group, YES. Cheering in the audience will be John Brabender, one of the country’s best known political media experts, ad agency owner, frequent contributor on MSNBC and CNN and long-time super-fan of YES. Brabender also led a crusade to get his favorite band inducted into the Rock and Roll Hall of Fame. Every once in a while, a project comes along that’s completely different and fun to shoot. With hits like “Roundabout”, “Owner of a Lonely Heart”, “Long Distance Runaround” and many more, YES, is truly a major group from the 70’s & 80’s. Yet they still have a huge, cult-like, devoted following that sells out every performance. For the group’s U.S. tour, Brabender asked Glenn Przyborski to direct and photograph several short videos that would play on YES’ concert video screens. They were tied to late 70’s nostalgia, including an homage to a scene from the movie “Almost Famous”. The videos were played before the band’s performance and to signal the end of intermission. The videos were edited at Phenomenon by Thad Christian. Michael Goodis created the original sound design. John Brabender created and wrote the original concepts. 1991 Pittsburgh Penguins The Penguins won their first Stanley Cup in 1991. Back then, KDKA-TV exclusively aired many of the team’s games. The station needed footage of featured players for use in on-air promotions as well as the open & close of the telecast. Przyborski Productions was contacted by Drew Moniot, KDKA’s Creative Development Manager to shoot a stylized video of the team’s players. Drew’s original concept was to capture the action and interaction inside the Penguin’s locker room, between periods of play. The video would be a rough, tough, stylized look at team members preparing to hit the ice for the game’s final period. Our player-liaison, Phil Bourque helped us plan specific action cutaways that were unique to each player. Tinsy Labrie, former Marketing Director of the Pittsburgh Penguins, scheduled the shoot on a team “personal day”, so players had to be assured that their on-camera segment would take no longer than 30 minutes to film. Makeup stylist, Patti Bell enjoyed creating a realistic, hot, sweaty look for each guy. We never had more than two Penguins on-set at a time, so uniformed extras filled-in the foreground and background. I shot all the footage on Kodak 5298 stock using my Arri 35BL4 and Zeiss Super-Speed lenses. Everything was shot from a Fisher 10 crab dolly. Film processing was handled by Producer’s Color in Detroit. The stylized “blue-bleach” treatment and enhanced grain were added to the locker room footage during the 35mm film-to-tape transfer at Postique in Detroit. After the winning ’91 season, we filmed our Stanley Cup scenes after-hours at KDKA, then transferred it as clean 35mm. Very few cities have their own submarine. Pittsburgh is the final resting place of the USS Requin, a diesel-electric sub that was built in 1945. WWII ended 3 days before the Requin’s first wartime patrol. She never fired a torpedo in battle. 2015 was the 25th anniversary of the USS Requin’s arrival at the Carnegie Science Center. It also marks 70 years since the sub was christened at Maine’s Portsmouth Navy Yards. The interior of the Requin looks and feels like she just returned from one of her many sea patrols. I was testing a prototype camera filter for an optical manufacturer and thought the detailed interior of a submarine would be visually interesting. After shooting for an hour inside the sub’s cramped quarters, I developed tremendous respect for anyone who could spend months at a time inside these machines. Not to mention the constant smell of diesel fuel combined with the danger of being a few hundred feet below the surface. The only submariner I’ve known is Chuck Aikman, a talented editor at PMI, who served on a nuclear attack sub. The USS Requin is well worth a visit at Pittsburgh’s Carnegie Science Center. Here’s a look at 4 distinctively different ad campaigns, all directed, photographed and edited by Glenn Przyborski. First, Sharon Regional Health System… This ad features Debbie Lewis, who’s alive today thanks to Sharon’s Cardiac team. We meet Debbie in her home which she shares with 54 unusual pets. The agency is Scoppechio from Louisville, KY.
Curing cancer of the lungs or esophagus requires specialists. Dr. Rodney Landreneau and Dr. Blair Jobe co-chair Allegheny Health Network’s Esophageal & Lung Institute. Produced for Mullen Advertising, this new spot introduces their team of patient-focused doctors. If you live in the Akron-Canton area, there’s a good chance your medical provider is Aultman Healthcare. This ad is part of a multi-spot campaign from the Innis-Maggiore agency to showcase the healthcare system’s total capabilities…everything from preemies to hospice care. The Marcus Neuroscience Institute is the latest addition to Boca Raton Regional Hospital. This commercial introduces their new 52 million dollar facility and its talented team of doctors. The spot also credits the philanthropic donors who made the Institute possible. Tom Chakurda created the campaign’s concept and wrote the copy. Edgar Snyder is the most recognized attorney in Western Pennsylvania. Edgar Snyder & Associates is also the region’s largest buyer of broadcast and cable advertising. I decided to shoot the spots, “documentary style” to contrast the law firm’s numerous graphic-driven TV ads. I wanted to show a different side of Edgar than his usual high-energy TV persona. The commercials were edited in our Strip District facility. They currently air on virtually every TV station and most cable channels throughout Western Pennsylvania. Giant Eagle is one of the largest supermarket chains in the country. Between 1994 – 2000, Przyborski Productions produced literally all of Giant Eagle’s TV advertising. These were years of tremendous growth for the multi-state company. During that time period, Giant Eagle’s advertising was fun, different, interesting and entertaining. 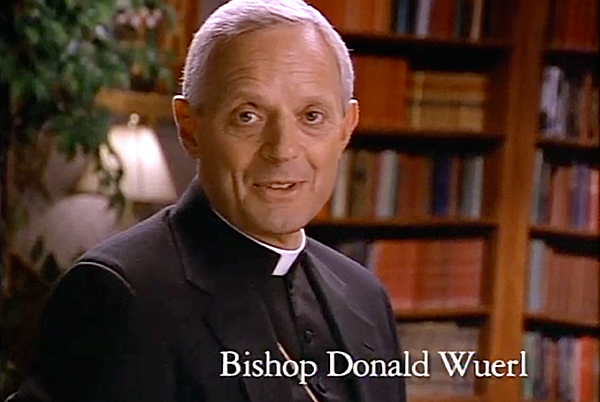 In 1995, Bishop Wuerl (now Cardinal Wuerl) was featured in a 35mm TV commercial, endorsing Giant Eagle’s “Apples for Students” program. With the inauguration of Pope Francis, Cardinal Wuerl has been all over the news. Some say he was under consideration to be the next Pope. Bill Garrison and Dave Hughes created a unique vehicle to introduce Eat’n Park’s new gourmet hamburgers. The concept required Przyborski Productions to produce a runway fashion show, only the featured items would be burgers, instead of designer clothing. The commercial was to be a fun parody of the popular TV show, “Project Runway”. Stylist, Rachel Vallozzi created the individual looks for the Eat’n Park servers who were actually experienced runway models. Glenn Przyborski photographed the food scenes during the studio set & light day. Food stylist, AnneMarie Leydon worked to insure the new burgers looked great on-camera. Custom made, high-intensity LED panels were used as “strobes” to simulate paparazzi camera flashes. Sarah Marince had fun playing host of the “fashion show”. Director/cinematographer Przyborski shot the commercial with a RED Epic and a Canon C100, both equipped with Canon lenses. Some of the non-sync cutaways were shot at 96 frames-per-second. Working with Garrison-Hughes’ producer Nan Quatchak, Ray Tragesser of UpperCut edited the spot. Rob Deaner at Market Street Sound created the original music and mixed the finished commercial. AutoZone wanted to re-broadcast a successful commercial that I directed and photographed in 2003. Back then, TV spots were produced in standard definition as most networks and cable systems weren’t accepting HD commercials. I shot the original Duralast battery commercial in 4:3 ratio, standard definition at 23.98 frames per second. Fortunately, we recorded the original video, non-compressed on a video file server. I went back to the 16 original scenes and removed the 3-2 pulldown which yielded progressive scan video at 23.98 frames-per-second. My son, John Przyborski, who created the visual effects for the spot, had saved progressive scan versions of each scene that included mattes or re-touch effects. The next step was to use the program, “Shake” to expand each scene so the progressive scan video became 1080 pixels high. Finally, on a 1080P timeline, I literally re-edited the entire spot, frame-by-frame. All title graphics, such as the Coast-to-Coast Warranty, Proven Tough, and AutoZone logos were re-inserted at full HD resolution. Doner’s art department created the shaded Duralast logo to pillar-box the left and right of the screen. The original audio mix from 2003 was re-used. You may ask, “Why the pillar-box format? Why not expand the original scenes to fill the entire HD frame?” The original scenes were framed for the standard 4:3 ratio TV format. To fill the top to bottom of the 1080HD image required a 224% expansion. To fill the entire HD screen (while maintaining correct image proportion) would require a 306% expansion. Also, by filling the left-to-right, the top and bottom would be chopped off. The “pillar-box” technique that we chose, yields an acceptably sharp HD image that’s also compatible with center-cut, standard definition TV. All across the country, traveling carnivals setup shop outside hundreds of small towns and cities. Within a day or so, workers transform an open field on the outskirts of town, into a midway with rides, games and lots of junk food. Where else can you enjoy chocolate funnel cakes and deep-fried ice cream? For many residents, a trip to the carnival’s an annual tradition. For the $5 admission, you can spend all day and night cruising the fair grounds. There’s groups of girls checking out the guys and catching up on mid-summer gossip. As day slowly dissolves to night, young lovers stroll the midway hand-in-hand. At a Midwest carnival, tractor and truck pulls are very popular. A powerful truck or tractor drags a weighted sled down a dirt track. It’s not a sophisticated sport, but it’s fun to watch and very loud! The owner of the winning entry gets a prize, but more importantly, all his friends know he drives of the most powerful truck in town. I shot this video to capture moments from a hot, humid July day, at the fairgrounds, just outside Butler, Pennsylvania.